The Emer Casey Fun Run for Ovarian Cancer will take place on Sunday 27th May at Jells Park, Wheelers Hill, Melbourne and registration is now open. Runners and walkers of all ages and abilities are welcome. The event starts at 10am and includes a 5k run/walk or a 10k run. There will be a free t-shirt for the first 75 people to register so don’t delay! 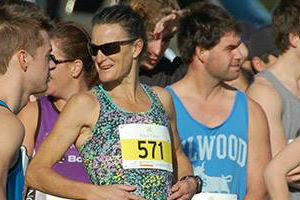 Registration information and all the details are here and the event organisers can be contacted at info@run4ec.com.au. The primary aim of the Fun Run is to raise money for ovarian cancer research at the Peter McCallum Centre in Melbourne, as well as raising awareness of the disease. Over the last ten years, the Melbourne run has raised more than Aus$282,000 and has grown from 17 participants in 2008 to over 400 participants last year. The Emer Casey Foundation is hugely indebted to the Melbourne organisers for their continuing dedication to this great cause.